Daily Routines Are Essential During Holidays. Grab our free printables from and create solid daily routines to keep you sane during the holidays! This is our last challenge that involves planning, which is the core of a well laid holiday season. Today is the perfect day for adjusting our daily routines for the busy holiday season. Every day during the planning session, please add additional time in to deal with clutter. Clutter zaps your energy and makes your clean house look messy. Daily routines are essential during holidays for busy families. 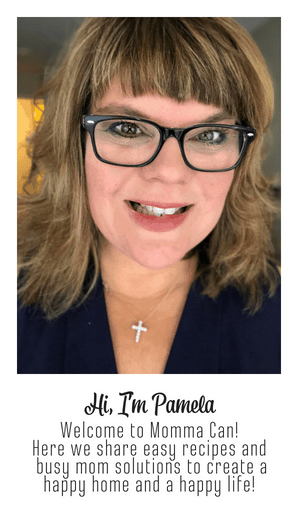 Children need routines all of the time, but we the parents need it especially during the holiday seasons to stay balanced and sane as we spin plates and chip away at TODO lists. Today we are going to write down our routines, morning, afternoon and night. This will give us a place to go when we need a checklist to keep all the wheels turning efficiently in our super busy lives. During this time of year, I add a 10 minute pick up session in the evening in addition to my 5 minutes or 52-pick up session every morning. Make Beds – It is a much happier day if we make beds together. Everyone’s routine will be different throughout the day. Your routine should be a simple a list to keep you on track when you are overwhelmed with the season, family and work obligations. 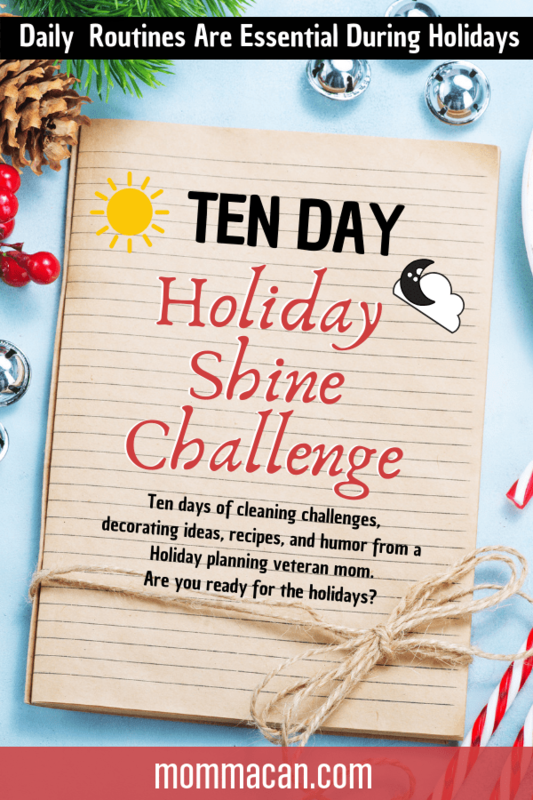 Holiday Shine Challenge- write down your daily routines leaving room for future responsibilities during the holiday season. Example: holiday prep time, this could include wrapping gifts, baking, or addressing invitations and cards. 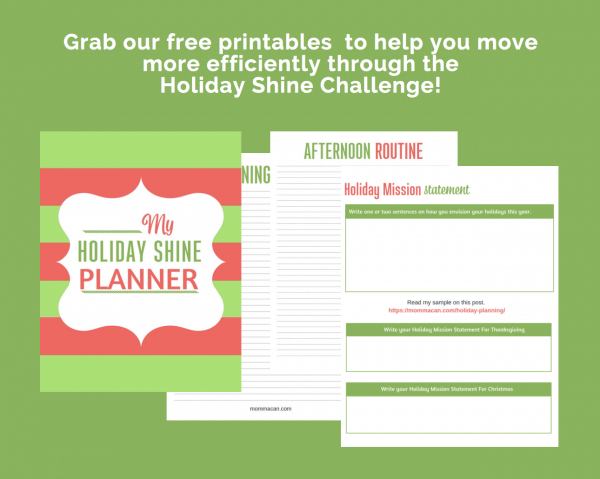 We have a free printable set, that matches our Holiday Shine theme available in the AMAZING RESOURCE LIBRARY! Grab your set!